Fat Does Not Make You Fat! This is the title of a post of a fellow Dubai food blog Bon Appetit! It is a beautiful summary of why fat is an important part of everyone's diet. It explains in simple terms what it does to your metabolism. She discusses the health benefits of common fats. A worthy and eye-opening read!! One fact that I wasn't quite aware of before is that the fat in your foods "triggers the brain to recognize that you are full, once you've eaten a certain amount of fat then it sets off a chain reaction that tells your body to stop eating. Carbs and protein do not have the same effect which is how you can easily overeat them, particularly carbs." When I read this I saw myself shoveling bowl after bowl of pasta for dinner, wondering where all the hunger comes from! It wasn't hunger. There was just no-one to tell my brain that I was full. Of course it is important which oils and fats you put into your body and that moderation is still the key. I love the vegetarian, vegan and raw cuisine as it incorporates lots of healthy and natural fats in a very natural way. Many dishes contains nuts and seeds, naturally oily foods are standard ingredients. Now here is my contribution to an "Eat Your Healthy Fat" diet. Raw and vegan truffles that contain ground almonds, raw avocado, cocoa powder and low GI dried apricots. 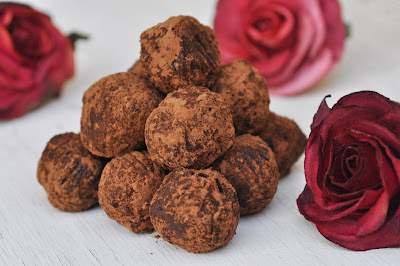 These truffles are full of good fats and do not overindulge in natural sugars. They work just the way they should by telling the brain when you had enough. I promise you will not overeat on these, but savor those few with full relish. Combine almonds, apricots, cocoa powder and cardamom in a food processor. Blend until it becomes a fine meal. Add syrup and avocado and blend again until well combined. Form balls (size of the walnut) from the batter. Roll each ball in cocoa powder for coating. Keep in airtight container in the fridge for up to three days. Freezes well.